I’m such a sucker for sports culture—the comradery, the excitement, the sportsmanship, the win-big together / lose-big together attitude, the drinking, the tailgating, everything. I’ve never been a diehard sports fan, although I loved playing sports myself, but I love the community surrounding sports. There’s a book by political scientist Robert Putnam from Harvard’s Kennedy School of Government called Bowling Alone: The Collapse and Revival of American Community. It is about the decline in all forms of social and communal engagement among Americans—and he famously uses the example of how the number of people who bowl has increased in the US, but membership in bowling leagues has steadily declined over the last couple of decades. Putnam is concerned about the education, enrichment, and general sense of civic duty being lost if people choose to do these kinds of activities alone, rather than with other people. I found this discovery to be quite remarkable, and also quite sad. I have always loved the idea of active and close knit communities in which people are very involved, even as far back as our country’s founding in the 1700s when a person ran for public office, or helped a neighbor, or defended a fellow citizen in court because he felt it was his civic duty to do so. To think this kind of mentality has been going away is quite, quite sad to me. And maybe that’s why the presence of such a mentality at a football tailgate or a varsity under-the-lights game is such a nostalgic and endearing thing to me. It’s a small reminder that this particular type of community engagement seems to be an undying breed. There is an unspoken amount of kindness, respect, and brotherhood, as strange as it sounds, among sports fans. When you go to a Buffalo Bills football game, you’re blindsided with the droves of people who choose to leave their homes at the crack of dawn to stand in the freezing cold and be together to celebrate a team they love, when they could just as easily (and more comfortably, more affordably) watch the game at home and drink beers on the couch, with a much better view of the game. There’s something so awesome about that, and it is a little piece of proof that even in 2015, simply being surrounded by friends and family and uniting for a common cause (the team, the game, the good laughs, the good memories) beats out any other solitary modern luxury. While some of what you witness might seem a little surreal (read here as the Bills' tailgate’s weekly ritual of the same man being doused in ketchup and mustard by people standing on top of a car), the overall experience is one that I find so grounding and comforting. Where most other places in life you are surrounded by strangers who keep to themselves, sporting events bring people together and turn strangers into neighbors, at the very least, and friends at best. So go make this slow braised pulled pork, and serve it to friends and family. Go to a tailgate, or throw a party; just share it with others. It’s downright fantastic football food, and it tastes much better when it’s enjoyed with other people. Preheat oven to 300 degrees, and set pork shoulders next to each other in a large Dutch oven or other large roasting pot with a cover. Start by pouring the liquids over the pork so that you don't add too much. You want the liquid to come up at least ¾ of the height of the pork, but not cover the pork. If it seems like too much liquid, cut the amount of beef stock you use. Add all the remaining ingredients and stir around so it's fairly uniform. Cover pot and set in the oven. Set timer for 4.5 hours, and forget about it! When timer goes off, check tenderness of the meat. When pried with a fork, meat should easily pull away and fall off tenderly. If it's not quite there yet, cover and cook for another half hour. It's difficult to overcook the meat at this temperature—you just want to make sure it's tender and pulling off the bone. Remove the pot from the Dutch oven, and remove lid. Let it sit for about 10 minutes before picking out the large pork shoulders from the pot and moving to a plate for pulling. (Save at least two ladles of the cooking liquid to make the sauce, recipe below). To pull meat, use two forks to gently pull apart, and remove any bones (this should be easy—they usually fall out). Pour Tyler Oliver's cider vinegar BBQ sauce (recipe below) all over hot pork for an even more moist and delicious pulled pork—although not totally necessary, and serve with your favorite bottled BBQ sauce (I prefer Dinosaur BBQ), as well as slaw (recipe below), on a soft roll. Combine all ingredients in a small sauce pan and bring to a boil over medium high heat. Reduce heat to low and simmer for 10 minutes until mixture is uniform and slightly thicker. Then, avoiding the garlic cloves, pour mixture all over pulled pork. Toss cabbage, onion, and carrots into a large mixing bowl. In a separate bowl, combine mayonnaise, vinegar, hot sauce, lemon juice, sugar, salt and pepper, and whisk vigorously until fully incorporated. Pour dressing over the slaw, and using tongs, fold over and over until evenly coated. Taste-test, and add more salt/sugar/hot sauce/lemon juice to your liking. 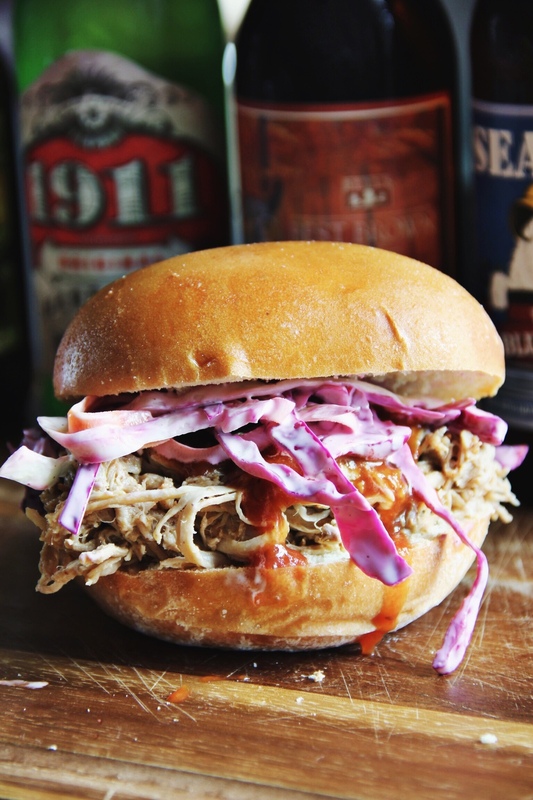 Top each pork sandwich with a small amount of slaw for a crunchy and tangy bite.